I did try a search in facebook, but not sure if any of the results are Molossus. So will try to contact via a PM here and hope to find him. It is serious as all of their comments have also been removed? They helped me so much with Dexter and his feather problems, with some of the best advice I had over the last two years. So was shocked to find all their posts removed. I seem to have lost any comments made by molossus. Dexters two new tail feathers have the same trouble as ever. Stress bars! That is so very sad. I had hoped this time all would be good. I am at a loss as to what is wrong. Do some research of how to apply Positive Reinforcement Training. This will help you form a strong bond. Do not do anything that might be negative. And learn to read the birds body language and respect it. Let the bird set the pace as you move forward. Topic: Hey all! I'm Addie! Re: Hey all! I'm Addie! Can a mod move this to somewhere else. As it does not seem to be getting the replies I thought it would. I invited this person here hoping you guys would chip in some good information. Hi Addie! Good to see you here. I hope the guys help out with their opinions for you. That was where I thought this was ????? But!! Very much so, I was never going to let her go back to them. She is part of my flock now. Topic: To clip or not to clip ..who's right ? Re: To clip or not to clip ..who's right ? Topic: Does my IRN have a feather condition? Re: Does my IRN have a feather condition? Topic: Our IRN loves me to death, but hates my boyfriend. Help! Re: Our IRN loves me to death, but hates my boyfriend. Help! The test kit has arrived from Aussy and I will take blood sample to be sent off by Friday. I have discussed that I want all the tests they can do on the dried blood sample. Except the DNA test. So poor Dexter is going to get the needle, maybe tonight. Topic: Can IRN's be re-homed if they're attached? Re: Can IRN's be re-homed if they're attached? Sounds great. I hope you have a great time with your new bird. It's great when they start to eat right away. Sometimes it takes a day or two. SO yes I think he is comfortable enough, and happy to be with you. It sounds like you may of pushed the syringe through the crop wall. I hope something can be done if this is the case. Fingers crossed, I am wrong. Feel free to send me any thing you find. I think the word is Barbering. When they chew the ends of clipped feathers. Got a pic of his latest damaged feather. Topic: How to clip my Alexandrines nails? Re: How to clip my Alexandrines nails? He looks in great shape and very proud. Topic: Can I give my IRN a bit of biscuit? Re: Can I give my IRN a bit of biscuit? It is stunning how they grow. And he looks to be in great condition. And look his tail is coming on well. Topic: Remy finally using her bird bath! Re: Remy finally using her bird bath! A good misting to go along with the bathing. It makes you very happy seeing them what I term as being relaxed and acting natural around you..
Topic: opions on clipping a birds wings? Re: opions on clipping a birds wings? InTheAir wrote: Wow, didn't realise u were in nz. Nice pic, looks like a lovely day at the beach 4 u both. Well you know 'Rangi Two Toes' Does that mean you are in NZ as well? Yes you are correct Dexter is 5yrs old, and I am sorry I posted in the IRN vid thread, but like to share and not many look in the Alex section. Most grasses are fine. I do not know of any that are not. I give my Fids grasses when in seed all the time in season. Topic: Does this include Vids of Alexandrine? Re: Does this include Vids of Alexandrine? Yes you are correct their are 6Tiels flying around. A couple pass over head in the vid, you just get to see the curtain move as they fly past. Thank you for the great comment on the Play Gym. It has grown since I first built it. And it is where the guys sleep most nights. But not always. Topic: Speaking of Bird Bathtubs - anybody using this one? Re: Speaking of Bird Bathtubs - anybody using this one? I hope the link works - not done it by my phone before. Great idea, turning the shower head up like that! And they sure do enjoy it. Topic: Some new pics of Mango and Dexter. Re: Some new pics of Mango and Dexter. Some new pics of Mango and Dexter. I take it you enjoyed such a fabulous event? I have meet Barbara and also follow her on Goodbirdgroup. She is super at putting on great workshops and this one being a two day event would of been special. Does this include Vids of Alexandrine? What a love bug already. You are going to have a beautiful relationship. Yes they are not like some Parrots and certainly the pupils dilate at a very rapid rate with emotions. Where some birds pin when they are giving you the evil eye. So I feel what you are seeing is her love for you. I did tell the owner I thought it was nothing to worry about, but have no experience so came to you for help. I think they have joined the forum? But was unable to post pic, so did it for them. Topic: Feather & Beak disease in young bird or just badly treated? I am sorry nobody has replied to you before. I am fairly new to Alex ownership and cannot tell my own. But here is a link that may help you. I think I have sorted my own out. Yes I allow both Dexter and Mango on my shoulders. Topic: Are your Irn's wings clipped? Re: Are your Irn's wings clipped? 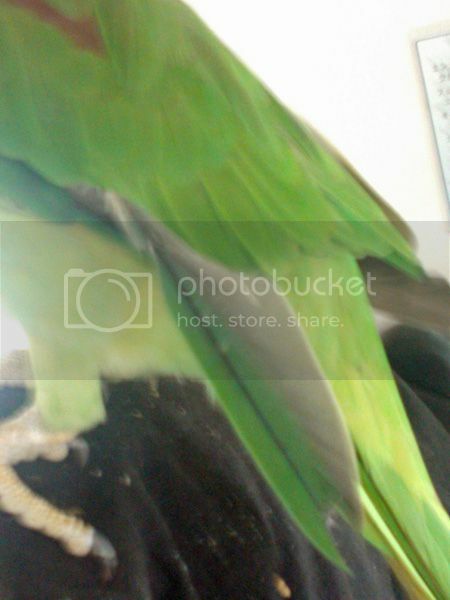 Topic: When to find my alexandrine male/female? Re: When to find my alexandrine male/female? His eyes are bright and to me I think you have done well.